Trying to explain where I come from is not easy. (I come from England but I live in Denmark...) What is less easy is trying to explain where I am going to and what I am doing! (I quit my job and Im just travelling...)Had a great taxi driver today, asking me a billion questions in broken english, but when I said I live in denmark he said ahhh CARLSBERG! So there was trip of Danes out there today and I think so far the danes have been the most suspicious and unfriendly people I have met. I even spoke Danish! The nicest so far are the malaysians and the singaporeans. Example male malaysian strangers on the plane both ways made sure i had a drink before they took one, this has never happend on my other flights! Its this old fashioned gentlemanliness I miss. Well people ask me if I am married and I say no, they look at me with great pity and say ohhhh Im so sorry. And then they ask why and I tell them Im divorced and they are again really sympatheic. Divorce here isnt common, again the traditional values hold. The Malaysians have been nothing but friendly and helpful to me, I feel quite safe here travelling alone. 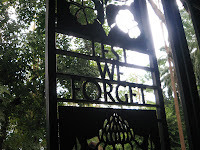 Moving on to the phillipines tomorrow where there is kidnapping of tourists and pirates.. hmm... sure it will be ok.
Whilst in Sandakan I visited the ex POW camp, which made me cry... thousands died there and in death marches accross the jungle. The japanese were very evil people! Todays photo is detail from the gate to the memorial park which is now where the camps were. Ok so friendliest so far: Malaysians. The women here are very beautiful, there are so many mixes, lots of chinese and indians and malay. The women in singapore were amazing looking. The thai women, not so pretty and most of them seemed obsessed with their looks, always applying make up! Im meeting up with people in the Phillipines, Cora in Manila, a friend of a friend whoøs taking me out on the town. And Jackson who I am travelling with. Will be nice to have some company again. It will be a hard journey though, as my flight goes into Clark airport which is a 3 hour journey from Metro Manila, still gives me time to meet and talk with new people huh?